I know I've been rather silent the past couple of years here, but I really haven't had much time for reading anything at all due to balancing a very demanding career with running on weekends. Lately, I've been moving up in running weight class, progressing to running 18 half marathons, my first 3 road marathons and yesterday, my first ultramarathon of 50K (31.1 miles). Running for hours at a time, especially when your body, even after losing over 120 lbs. in the past four years, takes a huge mental and physical toll and it certainly changes you as a person. The readings I've done this year have largely been by ultramarathoners. While I hope to talk more about them at length around the end of the year (after all, four are 2018 releases), I have to say that I've learned a lot about perseverance and realizing just how strong I can be in my weaknesses from reading those books and then enduring some of the same obstacles myself. 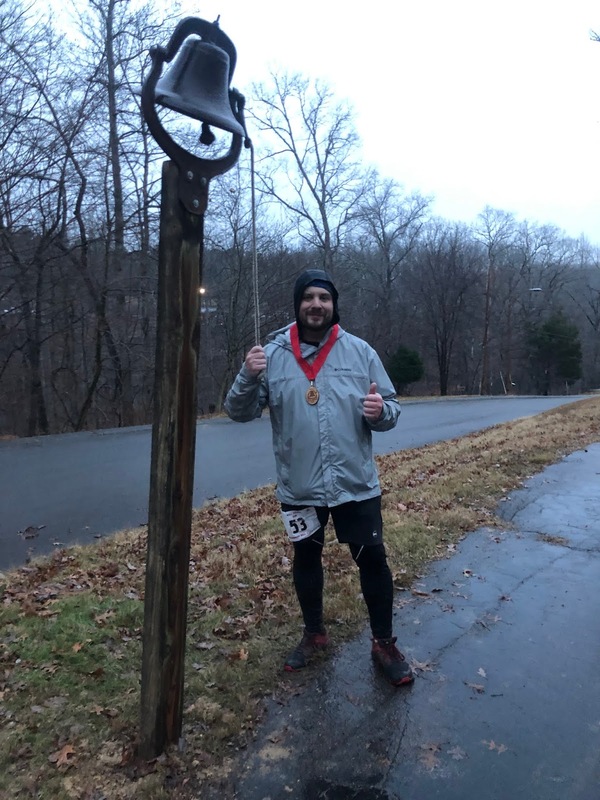 Yesterday's ultra, the Bellringer 50K, was not run in what most people would consider ideal conditions: It had begun snowing about an hour or so before race time and while the road temps were just above freezing, it certainly made the trails at Montgomery Bell State Park rather slushy and treacherous at times. I had 9.5 hours to finish and it took 9:25:25 to do so, thanks in large part to the support of several volunteers, including one who came out and ran/walked the final 4 miles with me, even if technically I had missed the time for the last cutoff by a few minutes. I grew up going to the park several times and I knew the backstretch well (I train by running up the course's final descent to begin my 10 mile training sessions), so I was able to just make it. However, the weather did take its toll. I found myself suddenly confused the final km and I staggered to the end. When I removed my thermal gloves, I saw that nearly the entirety of each finger was bone white due to the wetness and cold. My speech was slurred and while I was able to ring the personal record bell (after all, it was my first 50K), I barely made it around the corner to my car and get a thermal blanket out of my trunk in order to warm up before driving the 10 miles home (idiot me forgot to bring a change of clothes since I live nearby). Took me nearly 3 hours to get the shaking in my hands under control enough to at least approach normal body temperature (my feet were also numb but not anywhere near in as bad shape since I had more layers on there), so yeah, I probably had mild hypothermia. Would I do it all over again, knowing the conditions? Most certainly yes. I'm already planning out at least four ultramarathons and 2-3 marathons to run in 2019 because there is something to be said about all but the most essential being stripped away until you are just left with the urge to fight on or to give up; nothing else really matters (except port-a-potties, electrolyte drinks, and M&Ms at aid stations) and that sense of having your true core exposed is an extremely powerful one. So yeah, I plan on running road in Miami in late January, a nearby trail marathon in mid-February, my first 60K in early March, my second 50K in early April, another local road marathon in late April, and my first 50 miler on May 4, 2019. I need to experience this stripping away of anxieties and self-doubts on the trails, as they assist with dealing with those quivering moments away from running. It's hard to believe that I started this blog back on August 25, 2004. Back then, I saw it as an extension of the old wotmania Other Fantasy section and little did I know that I would cover a wide range of literary genres until I began to transition away from heavy reading/reviewing when I took my current job in December 2016. Although I'm nowhere near as active (I really do need to buckle down and write a review sometime, right? ), I'll probably keep this blog active for a long while, even if my postings might be reduced to a handful a year instead of hundreds. For those who do see this and have followed me through all the twists and turns, thank you. It's been a wild ride (especially considering I was in a bad car accident two days ago and was lucky to walk away from it - I got sideswiped at 45-50 mph and if the angle of the other car and been just a few inches over to the right, it could have been deadly) and perhaps there will be a day when I return to reviewing more often (if my eyesight will permit me - I'm becoming both near- and far-sighted, with astigmatism in my left eye compounding matters). We shall see. But until then, I shall continue to enjoy the good things (and people) who've come into my life over the past 20 months. I am fortunate. Hope all is well with you also.